The best way to have your instrument cleaned and sanitized. Ultrasonic energy causes alternating patterns of low and high pressure phases which form microscopic vacuum bubbles. During the subsequent high pressure phases, the bubbles implode violently. This is called cavitation. Cavitation provides an intense scrubbing action that leads to unsurpassed cleaning speed and consistency. Additionally, the bubbles are small enough to penetrate even microscopic crevices, cleaning them thoroughly. 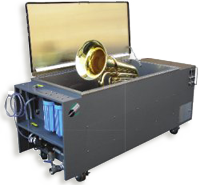 As a result, ultrasonic cleaning is one of the most highly effective and efficient methods for cleaning your brass or woodwind instrument.